This classic Concord Chest of Drawers features gentle curves in the base, and lightly tapered legs to give it a warm American-country charm. These chest of drawers feature four full-size drawers, and two half-drawers - all drawers are solid hardwood, and feature dovetailed joints and full-extension slides! Authentic Amish craftsmanship results in apiece of absolute structural integrity. 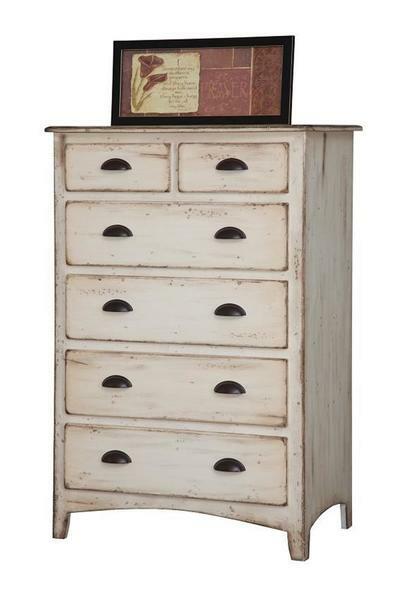 Expect this solid hardwood, handcrafted dresser to remain with you for a lifetime! Feel free to contact us toll-free at 1-866-272-6773 with questions or to get an order started.